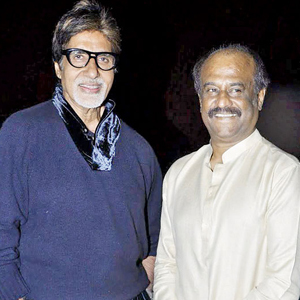 Big B to share screen with Rajinikanth in Enthiran 2! Superstar Rajinikanth and mega director Shankar’s Enthiran 2 pre-production works have begun, and the film is getting bigger each passing day. While Shankar has all planned to bring Hollywood superstar Arnold Schwarzenegger on board for negative lead role, we hear that the Mega director has also approached Bollywood legend Amitabh Bachchan for a crucial role in this sci-fi film. approached Big B and narrated his role, and the latter has even given his nod for the film. So, if everything goes well we get to see the two legendary actors Amitabh Bachchan and Rajinikanth sharing the screen space. They were last seen together for the Hindi film 'Geraftaar', released in 1985. It is worth mentioning that Amitabh's daughter-in-law and actress Aishwarya Rai was the heroine in the prequel version titled Enthiran, which was a blockbuster at the box-office. Amy Jackson is roped in as the lead heroine in Enthiran 2. Shankar is likely to make announcement on the film on December 12 on Rajinikanth’s 65th birthday.